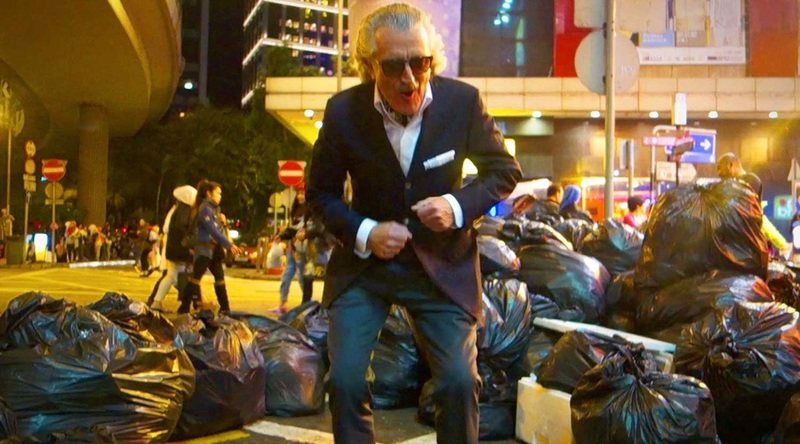 Dieter Meier is a man of many parts. 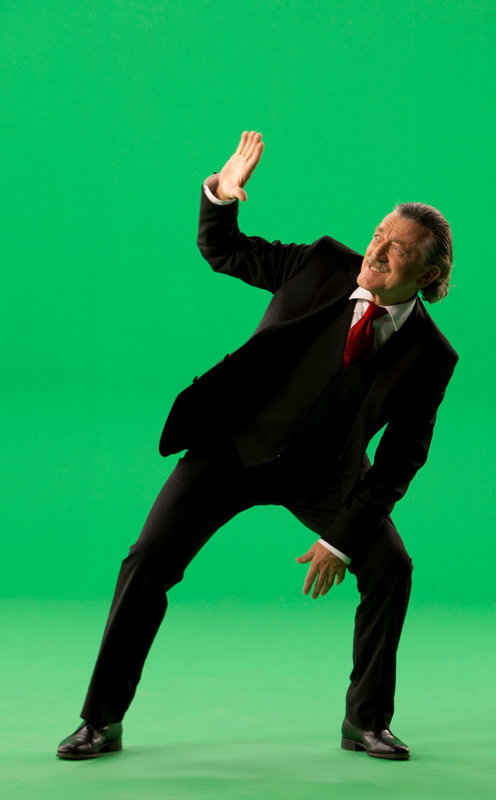 In a modern, cultural setting, he is probably best known as one-half of the ground-breaking Swiss-based electronic band Yello. 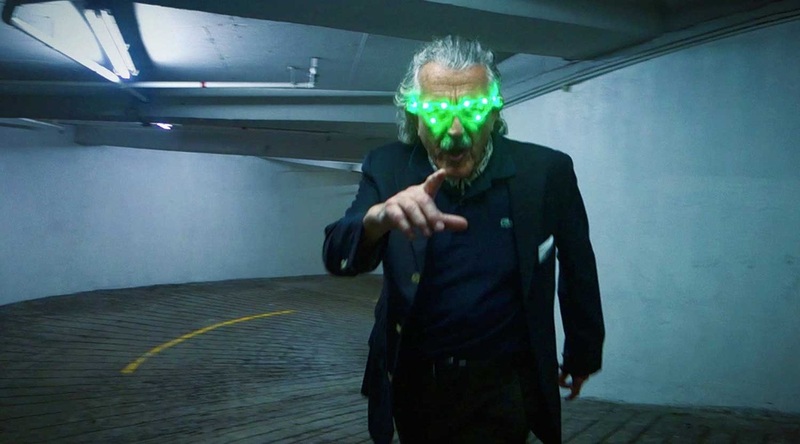 Musically, he has crossed genres from avant-garde, punk rock and even mainstream success, while also making a mark for himself as a conceptual artist, a film director and an International entrepreneur. He was born to a very wealthy family but instead of following in their footsteps, he has taken chances throughout his life, both in his artistic pursuits and in his Business endeavours. Somehow, he’s managed to balance his success in different areas and continues to follow his path forwards, ever keen to find out where the next step is going to take him. Most recently, he has released his first ‘solo’ album, ‘Out of Chaos’. 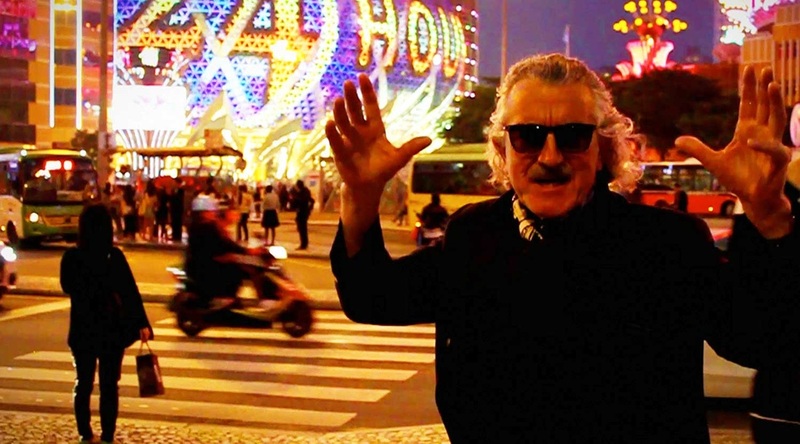 Although containing some similarities with his previous music, it’s also a clearly-defined tangent to the rhythmically-based music you might expect from Yello, and instead delves into more traditional song-structures. 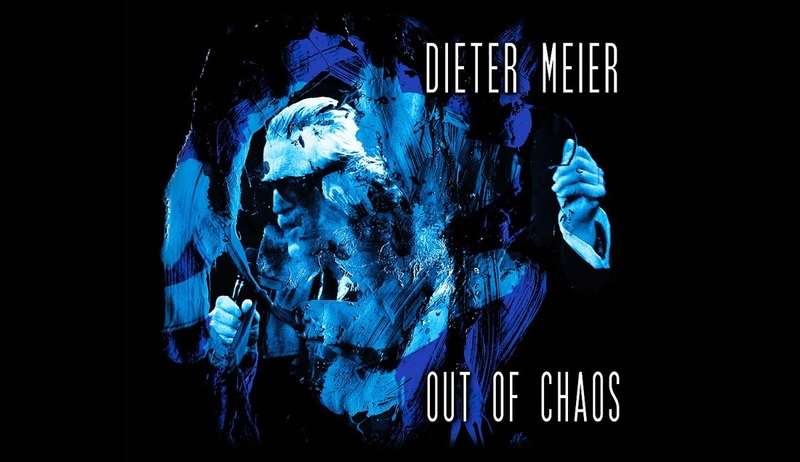 The album has also led to a series of live concerts with full band line-ups, which have been the first time Dieter has embarked on entirely-live performances. Not an obvious thing for a 69 year old artist to suddenly decide to do, but again, it’s all about taking the chance. 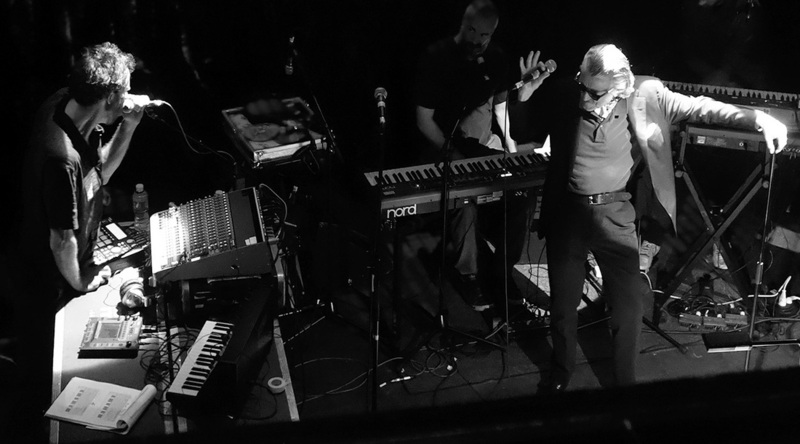 In September, Dieter Meier brought his band to London to play at the Jazz Cafe and, thanks to the efforts of the ever-charming Nita, I was able to secure an interview. First meeting at the venue, it quickly became apparent that the soundcheck was going to drown-out our conversation, so we promptly relocated to a nearby coffee-bar. I began with the obvious question about his recent solo album – why did he decide to release it at this point ? When you were writing these songs, why did you decide to use them aside from Yello ? Did you think they couldn’t really be accommodated within Yello’s format ? The first two Yello albums came out on Ralph Records. Do you think you and Boris had a similar approach to music as The Residents, even though musically it sounded quite different ? Were there any other particular influences while you were making those early records ? Your ‘solo’ album is called ‘Out of Chaos’, which is also the title of your biography. Is that a phrase that’s particularly significant to you ? You’d already established yourself as a conceptual artist before then. What was it that made you decide to become involved in music as well ? The ‘Cry for Fame’ single, and also the ‘No Chance’ single by Fresh Color (for which Dieter sang lead vocals) were two of the earliest Punk singles released in Switzerland. The music is pretty raw and aggressive - what attracted you to that kind of music ? I wondered if the record label, Periphery Perfume, (which also released another single by Dieter, ‘Jim For Tango’ and the first Yello 12”) was your own label ? When you make music, do you think there are any similarities with the way you approach your Art projects ? 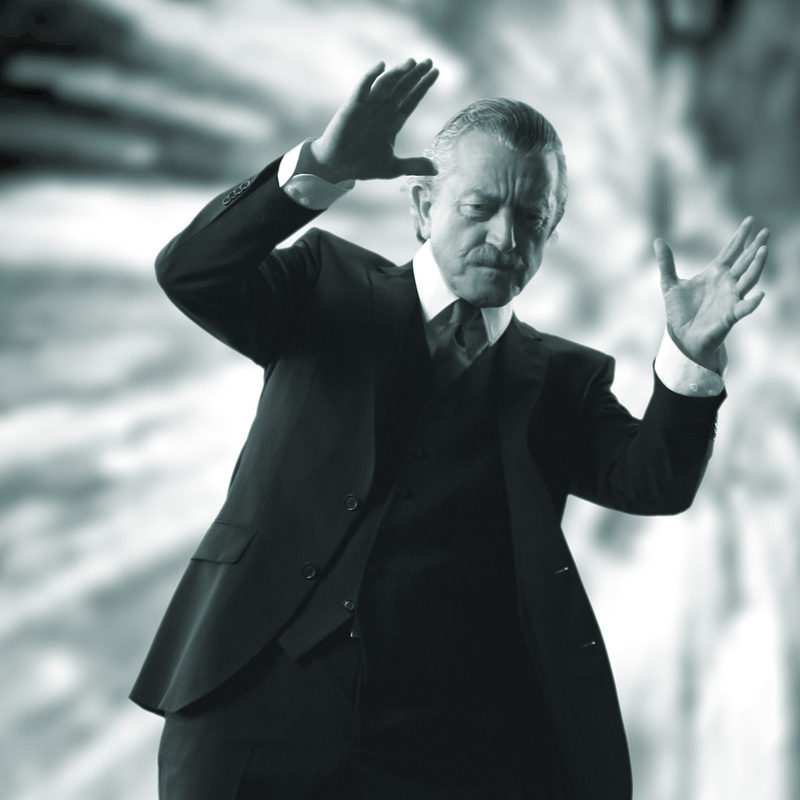 Despite coming from a more avant-garde background, Yello have still managed to achieve considerable mainstream success. Has that come as a surprise to you ? You already mentioned that you’ve recently been back in a studio with Boris, but do you consider the ‘Out of Chaos’ album to be part of a separate ongoing project ? You’ve been involved with so many different projects over the years, from music and film through to Conceptual Art, as well as running your own businesses and having your own family… How do you ever manage to balance all of these things successfully ? Dieter has to return to the venue for his part in the soundcheck, so the interview ends there, but it had been a real pleasure talking to him. Now, I have a few hours to kill before the concert begins, so I decide to wander around Camden for a while. But it’s not so interesting these days, there’s nothing really left to see and eventually, I return to Parkway and luckily bump into Nita, so we head up to the Spread Eagle for a drink and a natter. Fortunately, not too long to wait for the gig itself, so we head into the venue just in time for the show. The band assemble onstage, a much larger ensemble than I had expected, and after a brief intro, Dieter Meier joins them for the first song, ‘Paradise Game’. The lighting is low, almost evoking a torch-song or cabaret performance, and the sound is excellent. Dieter’s voice is as distinctive and full of character as you would hope for, perfect for the emotive arrangement of the music. 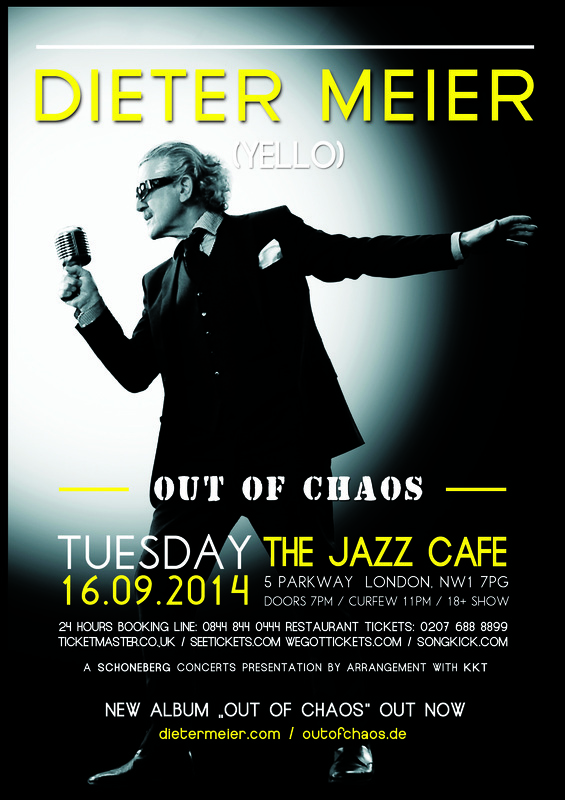 The entire ‘Out of Chaos’ album is performed, including the download-only track ‘Down Down’, plus one unexpected Yello song in the shape of ‘Prisoner of His Mind’. I doubt that any Yello fans would have been disappointed, but this was very-much its’ own entity. As I’ve said in the review of the album, the closest comparison I can think of would be Gavin Friday’s excellent ‘Shag Tobacco’ album and, whilst still coming from a more avant garde direction, this is certainly accessible, intelligent music. Take a chance with it. Perhaps it isn’t the sorta thing that you’d usually listen to, but it’s always good to find something new.